Jamie at Uptown Girls let me know of a fantastic giveaway she is a part of. She is inviting all of us to join in the fun! The giveaway is running via Facebook. 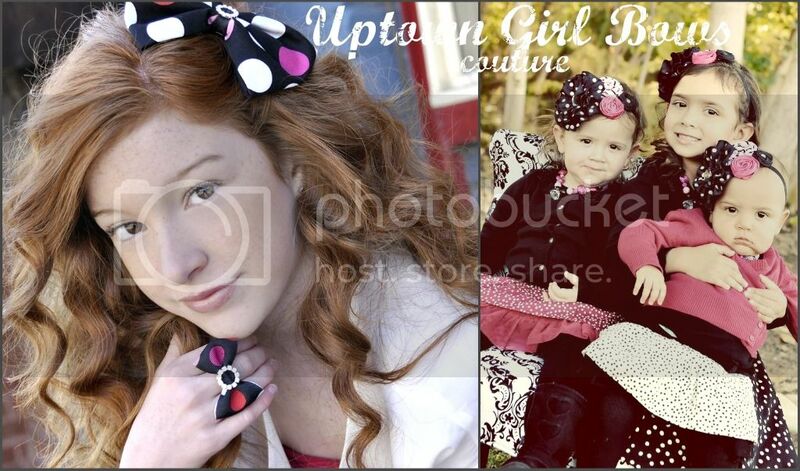 She is offering a $50 gift certificate + FREE Bowdacious Hair Bow and BLING bow ring. How cool is that!? I also forgot the biggest part....The Giveaway is FREE to enter and with all the Vendors together, the GRAND Prize is $5,600 worth in products for FREE!! So hop on over to Vintage Rose Wraps and enter to win in their 10K Love Giveaway. I know I am heading over right now!! Hey!! I am following via Linky!! I am so upset over GFC going away!! !